You know what I’m tired of? Godwin’s Law. Who do I need to see about getting it repealed? Person A makes a comparison between something happening today and something the Nazis did. Person B expresses outrage. How dare you?!? Person A clarifies, and the clarification is always the same: I’m not saying that today’s bad thing is as bad as what the Nazis did. I’m just illustrating. Person B will have none of it. All comparisons to Nazis are ipso facto outrageous. Glenn Greenwald and Joe Klein act out this kabuki to perfection today. You can put me on Glenn’s side here. Not on the substance of the argument (where I think both sides have a point), but simply on whether or not it’s OK to illustrate a point by reaching into the history of World War II for an analogy. I say: why not? WWII analogies are extremely useful because they’re familiar to almost everyone. In this case, Glenn is arguing that the invasion of Iraq wasn’t justified by the fact that the Kurds welcomed it, and he could have illustrated his point by saying that, likewise, Vietnam’s invasion of Cambodia wasn’t justified because they were welcomed by some of the survivors of the killing fields. But you know what? Not many U.S. readers are familiar with that bit of history, so the analogy wouldn’t help much. If you’re looking for something that lots of people will understand quickly, Hitler and World War II are fertile fields. Yes, yes: historical analogies should be used carefully, and if you really are suggesting that [blank] is as bad as Hitler/Nazis/the Holocaust, then you’d better be damn sure you mean it. But if you’re just reaching for a point of comparison that will be widely understood, then why not? Contra Klein, this isn’t a “litigator’s trick.” It’s just a handy way of making an easily understood comparison. 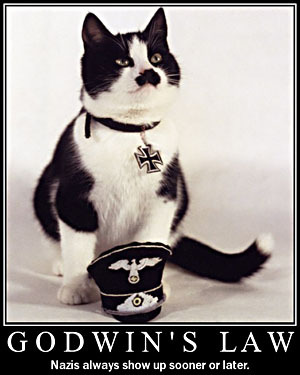 And if Godwin doesn’t like it, tough.